The Commodore 64 is back, baby. Thankfully, the new version will feature, um, a tad more memory than the original. It had 64 kilobytes -- barely enough to power Pac-Man or Pooyan. But -- boy, you've got to give that little-computer-that-could its props. Even though it cost $595. In today's dollars, that's like eighteen million. We had the cassette hard-drive, and then the floppy disk drive, which was louder than our washing machine. But at least it played Summer Games! Dang, that was some high-tech Olympic action, right there. Did you have a Commodore? Here are a couple of early TV commercials for this technological wonder. The Summer Games cartridge should have come packaged with a free joystick because that game meant instant joystick destruction. Yes -- we went through our share of joysticks with that game, too. Swim, darn you, little digital guy -- swim! 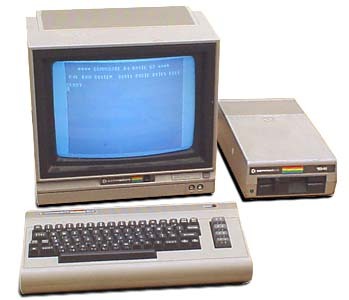 Not sure why anyone would want one of these new Commodore 64's. If you're a collector or nostalgia buff, you're better off scouring Craigslist, eBay or local yard sales to pick up one of the originals. With the coming of the Commodore 64, I experienced jealousy over lack of sufficient memory very early. I had its progenitor, the Commodore Vic 20 (cassette tape drive and all) and I wasn't able to join the Commodore 64 Computer Club at school. Woe was me.